The man was very excited to bring home Legends of Andor for us to play. So excited in fact that he went ahead and purchased the Star Shield expansion before we’d even had a chance to play the base game. The plotlines for Andor go something like this: the security of your kingdom relies on you cooperatively completing quests as you move throughout the land (i.e. around the board) and encounter creatures hell bent on invading the castle. You’ll never be able to stop all of the creatures from invading the castle but you must keep your eye on how many you allow through, because any more than the maximum permitted and you lose the game immediately. Fending off the creatures involves rolling dice to score higher than they do to defeat them (you also roll dice on behalf of the creatures). I’m all about kings and queens and defending noble castles so as we unpacked the game I held high hopes for the potential levels of joy Andor would bring me. The artwork for this game is well drawn and quite beautiful. The board is expansive with a soft palette of colors that pulls you into the storyline. 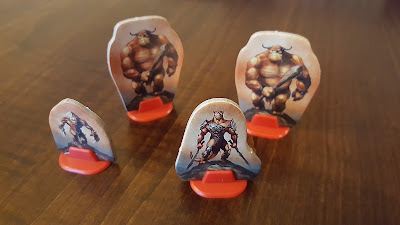 There are a lot of game pieces of varying types and sizes that come with this game - mostly cardboard figures to be slotted into plastic holders for standing upright on the game board. While the pieces are also well drawn, they are of average construction so you’ll need to keep them away from toddlers and pets who could easily rip or destroy the components. The game designers provide a quick start guide they instruct you to follow for the first game in order to learn the mechanics of play. They make it a point to ask you NOT to read the full manual until you’ve played through the first game using the quick start guide. That made for quick setup and getting into the game without having to pour through a half hour of instructions to understand every nuance. 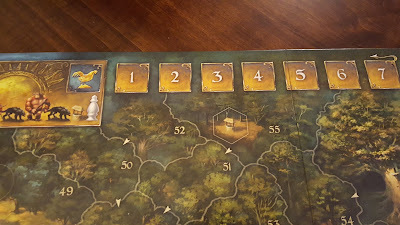 Even after completing the first scenario (which are referred to as legends) and getting into the meatier rules book, I found the game mechanics easy to grasp and follow. A heavy euro game this is not; play flows pretty smoothly. While the game is easy to understand and has great theming, as we played through the game, tackling the starting legend and then the first and second standard legends, the low points of its mechanics design caught my attention. It’s a cooperative game, which in and of itself is not a negative (although I strongly prefer cooperative games layered with a bonus structure or otherwise competitive rewarding subsystem for the individual players) but it doesn’t have the necessary safeguards in place to discourage stronger willed teammates from pushing their fellow players to do their bidding and effectively using them to play solitaire. It was a constant struggle with the man as he pushed for me to HERE or HERE or fight this creature with him instead of doing the things I wanted to prioritize. Give me a game where we can divide and conquer and I fight a monster and you fight a monster, over a game where we both have to fight the same monster together to win. Please. My other design criticism of the game is admittedly a petty one but nonetheless it targets a visual element that really grates on my nerves. 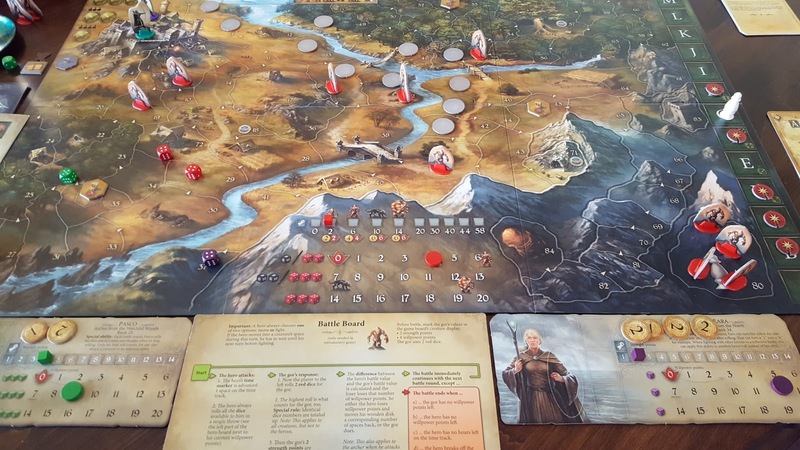 In Andor, you have seven hours as a player to complete tasks before the day begins again. You start on the sunrise space, i.e. 0, and each time you take an action you advance to the next hour’s space. When you hit the 7th hour space, it represents the end of the day and you are finished. Which means you go back to the sunrise box (normally; there are exceptions that let you go into overtime for an 8th hour or beyond). Below is a picture of the time track. You can see that there is a little arrow at the end of the 7th hour space that curves back around to the sunrise space. In practice what this means is that you move your token to the 7th hour space after taking your 7th action and it is immediately the end of your day, so you move your token back to the sunrise space. Which makes the 7th hour space pointless. Since reaching the 7th hour ends your day, it would make much more sense to have the arrow curve back to the sunrise box from the 6th hour. I will continue to play this game as well as the expansion in order to work through all of the quests and hopefully as the man and I move through the game we can master cooperation in addition to the game.